Shabby chic or just shabby? With their spacious palm tree dotted grounds, this laidback option gets a qualified yes from us. Located more or less at the centre of Coral Beach you can’t miss the skyscraper tall palm trees or their tractor tire signboarding. There is plenty of space for kids to run around (possibly with helmets to prevent death by coconuts) and the beach frontage here is the least developed on the beach. Their basic chalets offer a bit more privacy with their ample spacing and the good folks who run it are helpful and friendly. The rooms are in passable shape, with big double beds, windows and decent (not too bouncy) flooring. 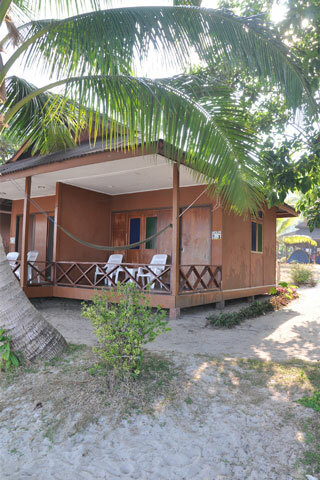 The beachfront rooms have a great position, but are pretty shabby inside -- still the price, for Kecil, is good. Camping is also allowed.